E.J.S is specialized in producing, repair and rebuilding screws, barrels and components for plastic product manufacturers, rubber product manufacturers, extruder and injection molding producer. With 25 years experience in serving our customer in plastics and rubber industry, we are aim to supply screws barrels with more wear resistance and corrosion resistance. 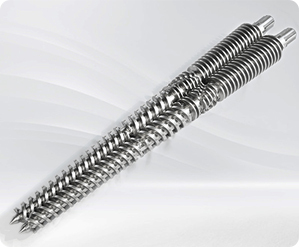 By providing a professional design and suitable steel & treatment according to the processing material type, grade and filler, we make our screws barrel a longer serving time. We offer screws barrels for all types of plastics such as PE, PP, Rigid PVC pipe and sheet, cable, LDPE, HDPE, Recycled plastics, Rubber profile, food etc., with varieties of added filler like glass, wooden, CacO3, Mg(OH)2. The treatment for screws barrels including heat treatment, Nitrided, several types of alloy for bimetallic screws and barrels. For screws, the alloy powder Ni60, Colmonoy 56 commonly used. For barrels, EJS01, EJS02, EJS03, EJS04 with different components are for your different requirement on hardness and wear resistance. Our screws barrels not only for big extrusion, injection molding, blow molding, but also mini screws barrels for 3D printers. With the hot selling of 3D printers in the world, we have produced more and more mini screws barrels for 3D printers these years. All screws barrels are produced according to the drawings. The drawings either provided by you or designed by our engineers based on your request. We also do repairing and trouble shooting for your old screws barrels.